We are proudly presenting our company as one of the leading manufacturer and transitory of admirable quality of the Jib Cranes in India. Being one of the largest manufacturers of the jib cranes we used to supply in every corners of the Gujarat. We are in procedure to furnish the qualitative material handling system for small work place; we have specifically designed and developed these jib cranes for the adequate functions. Our cranes are specially made to reduce labor cost and also save the time. Our products holds the special features like sturdy compatibility and easily usable. It helps to eliminate the time loss of being waited for over head crane or the forklift of crane manufacturer. 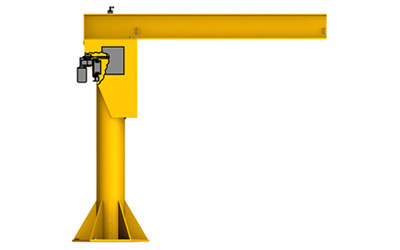 This crane is easily handled by one person, which helps to cut down the production cost. Our products are highly preferred as material handling equipment for the individual work stations. Our product is best for general purposes like loading, transferring and handling works. These are frequently usable for both outdoor and indoor services. We frequently used to offer two formats of jib-cranes, or post-mounted jib and the wall column mounted. 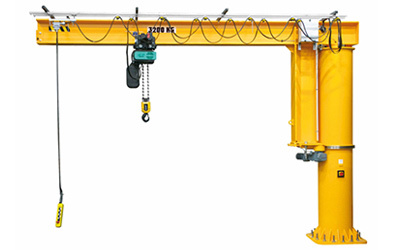 Our Jib Cranes can be mounted on existing column or wall structure which provides 180 degrees of boom rotation. We can also offer self supported Pillar mounted Jib cranes with 360 degrees of boom rotation. Our jib cranes always provide the accurate performance with outstanding durability to run for long time period. These can be customized as per our requirements listed by the client. Span -- up to 6 mtr.